Join, Renew, Upgrade your NRA Membership Here! With Discounts!! The NRA Basics of Personal Protection Outside The Home Course is both comprehensive and intensive in its approach to equip the defensive shooting student with the skills needed to survive serious adversity. The course teaches students the knowledge, skills and attitude essential for avoiding dangerous confrontations and for the safe, effective and responsible use of a concealed pistol for self-defense outside the home. Students have the opportunity to attend this course using a quality strong side hip holster that covers the trigger, or a holster purse. From a review of safe firearms handling and proper mindset to presentation from concealment and multiple shooting positions, this course contains the essential skills and techniques needed to prevail in a life-threatening situation. 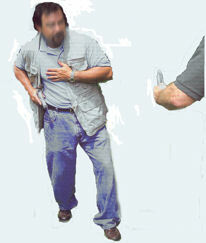 The NRA Personal Protection Outside the Home is divided into two levels (basic and advanced). Level One (Basic): Nine-hour course offering the essential knowledge and skills that must be mastered in order to carry, store, and use a firearm safely and effectively for personal protection outside the home. After the classroom portion, students should expect to spend several hours on the range and shoot approximately 100 rounds of ammunition. Level Two (Advanced): Five hours of range training and teaches advanced shooting skills. Students should expect to spend several hours on the range and shoot approximately 115 rounds of ammunition. The ammunition requirements are minimum and may be exceeded. Students will receive the NRA Guide to the Basics of Personal Protection Outside The Home handbook, NRA Gun Safety Rules brochure and a course completion certificate upon successful completion of each level. The NRA Basics of Personal Protection Outside The Home participants in this course must be at least 21 years of age and possess defensive pistol skills presented in the NRA Basics of Personal Protection In The Home Course. Participants must also understand the basic legal concepts relating to the use of firearms in self-defense, and must know and observe not only general gun safety rules, but also those safety principles that are specific to defensive situations. Pre-requisities: NRA Basics of Personal Protection In The Home Course Certificate; NRA pistol competitive shooting qualification card; Military DD 214 with pistol qualification or upon request pass the NRA Pre-Course Assessment administered by APDS. You may bring your unloaded/cased/holstered firearm into the classroom. Live ammunition is NOT allowed in the classroom! The single most important thing for you to bring is…a safe and responsible attitude! Knowledge, skills, and attitude are the keys to safe and responsible firearms handling and ownership. Visit our schedule for class dates and registration links! Contact Barry Allen at 919-868-7354 for more information.